Details and specifications of Dikduk, £39.00. Introduces the basic principles of Hebrew grammar in a fresh new way that will make learning satisfying and pleasurable.. Buy Dikduk now. You can read Hebrew. You may have studied basic vocabulary. Now, it's time to take the next step. It's time for Davka Dikduk! Davka Dikduk helps you understand and learn Hebrew grammar, with informative, imaginative lessons, combined with challenging, enjoyable, and entertaining quizzes and exercises that reinforce material studied in the program. For the first time, Dikduk-Hebrew grammar-is FUN! Davka Dikduk represents the culmination of a long and arduous process, years in the making, in our quest to design the very best Hebrew grammar program available. Developed by an expert Hebrew-language educator, Davka Dikduk introduces the basic principles of Hebrew grammar in a fresh, new way that will make learning satisfying and pleasurable. The parts of speech and how to use them in sentences, Roots and their inflections (prefixes and suffixes), Verbs in past, present and future of shelemim ('regular') and other categories in the first of the seven grammatical constructions, Binyan Pa'al Rules for feminine and masculine nouns, Pronouns and prepositions. 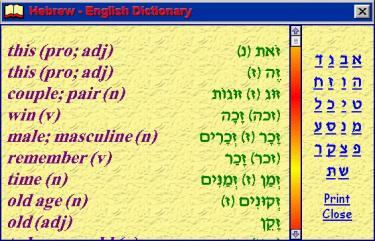 Davka Dikduk was designed to make the process of Hebrew grammar study visually intuitive, and easily understandable. All of the exercises, quizzes, and information screens were painstakingly developed and built, in order to facilitate understanding of the underlying principles of Hebrew grammar. The program's interface is structured smoothly, allowing quick and easy access to all units, stories, quizzes, and exercises. Colourful screens abound, and lively music and sound effects make Dikduk-Hebrew grammar-fascinating, fun, and enjoyable. Davka Dikduk features five units. Apple MAC Yes Mac Minimum: Power Mac 166, 32 MB RAM, CD-ROM drive, System 7.5 and above. Mac Recommended: G3 233, 64 MB RAM, CD-ROM drive, System 7.5 and above. P&P will be charged at "light/heavy items" rates (1/2/3 or 3/6) - click here for full Postage & Delivery Details including shipping rates within the UK, Europe and worldwide, and next day before midday options.